I just glanced at the calendar and I’m shocked to see that Thanksgiving is less than two weeks away! As you gather with family and friends for this annual feast, don’t forget to also fill up on family stories. I have more to say on this below. I think I was about seven years old when I first really “overdid it” on Thanksgiving. The dining room table in our small home in suburban New Jersey was packed with holiday offerings, with not an inch of room to spare. There was turkey, of course, as well as mashed potatoes and gravy, baked sweet potatoes, cranberry sauce, string beans, corn – and, of course, pumpkin and apple pies. I was pretty much an eating machine at that age and shoveled in second and third helpings of everything, including dessert. When I finally pushed back my chair and stood up, my stomach let me know how it felt – and, believe me, it wasn’t good. Bloated, in pain, and barely able to walk, I waddled a few feet into our living room and collapsed into an overstuffed chair. I spent the next hour or two there, moaning softly, until the lead weight in my middle lifted. It was a bit of a lesson about the virtue of moderation, and one of my earliest Thanksgiving memories – one that I’ve always found pretty amusing. This year, as you gather to create new Thanksgiving memories with your family and friends, remember to share your stories of past holidays. And don’t forget to record them in some way. Doing so will be fun for you and also very valuable for the children joining you around the table. University research has shown that kids who know stories about their families enjoy higher levels of emotional well-being. That’s because family stories give young ones a sense of identity through time, grounding them and showing them where they fit within their family and where their family fits into the greater world around them. Celebrating your Thanksgiving traditions and sharing recollections of holidays past is part and parcel of all that. So as you slice the bird or the tofu loaf, don’t forget to carve out some time to share and record your family stories. In years to come, you’ll be thankful you did. 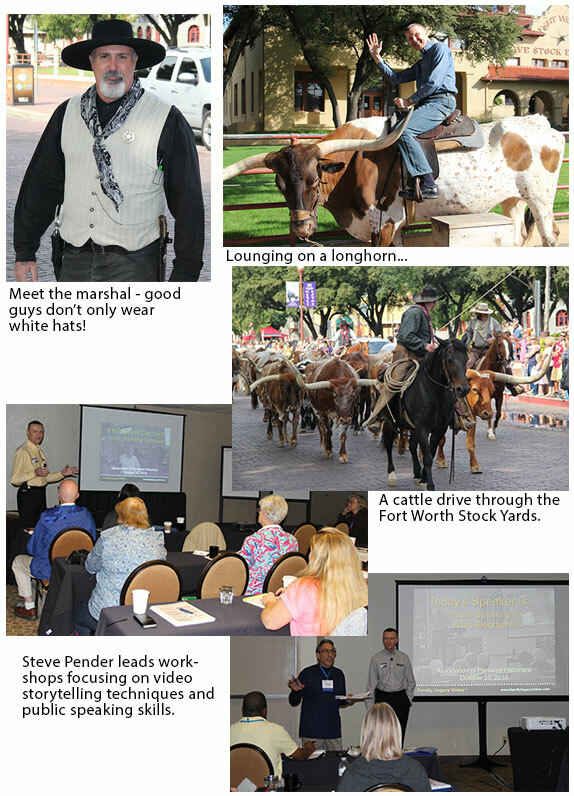 In late October, Family Legacy Video’s president, Steve Pender, took part in the 2016 conference of the Association of Personal Historians in Fort Worth, Texas. Steve led two workshops and participated in a panel discussion on client relationships. He also spent some time lending advice to other video biographers during ten-minute long “speed coaching” sessions.